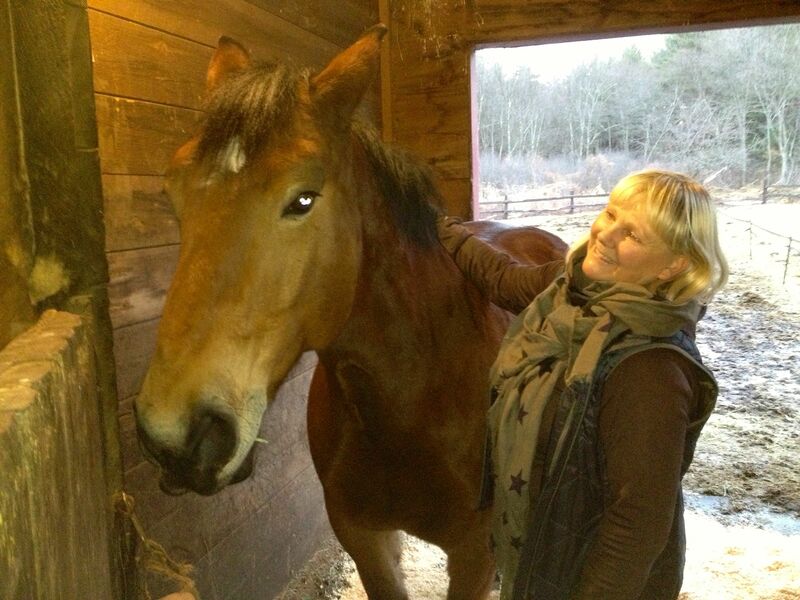 Charlie, and his owner Marianne, moved to our barn in January. Charlie joined our small herd at the beginning of January. He’s a sweet horse who took the move with great equanimity. Whenever we bring a new horse on property, we introduce them slowly. 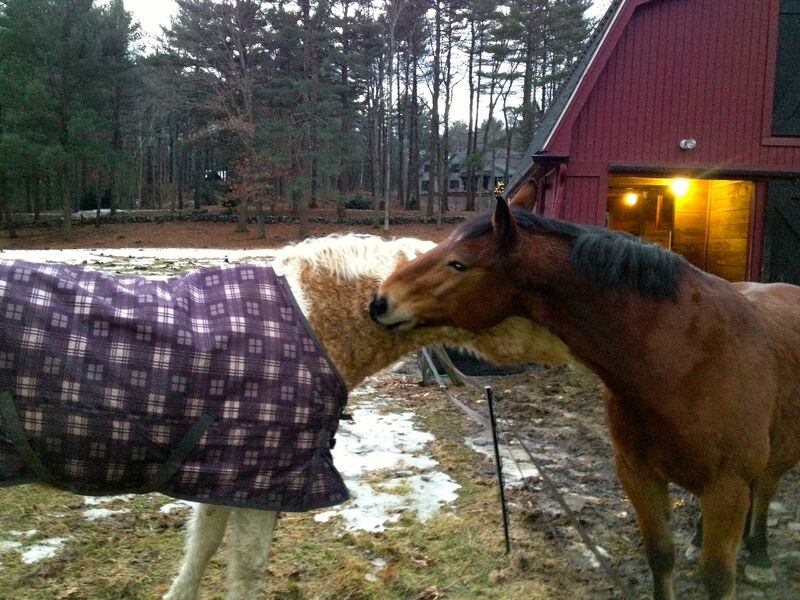 Typically, they spend some time in their own paddock, where they can touch noses with the other horses and get used to each other. Charlie is in the barn where Curly and Zelda reside and since Zelda can be bossy, I wanted to take it slowly. We let horses get to know each other over the fence before we turn them out together. Charlie and Curly seemed to be making friends quickly. Charlie, it seems, is impatient. And he is impervious to electric fencing. 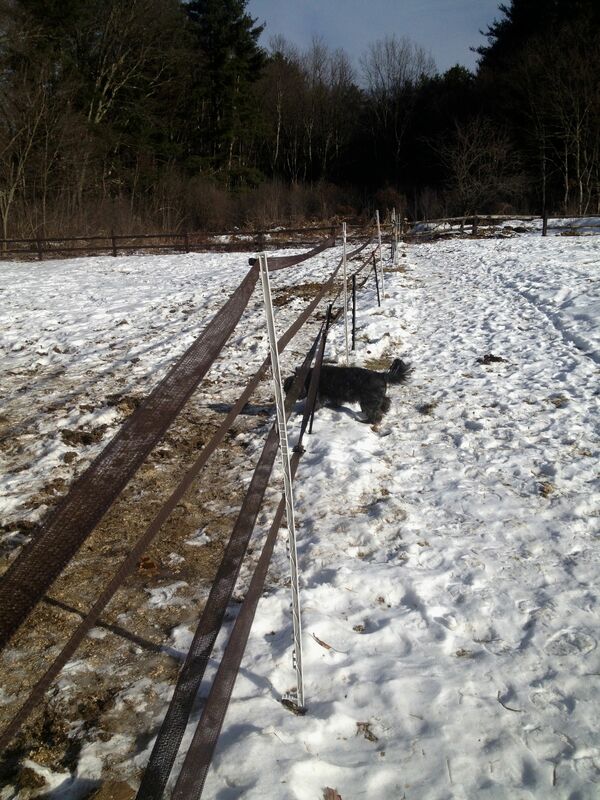 All of our internal fencing is electric and up until now, it’s been sufficient. Of course the best time to introduce a horse to electric tape is during the summer when the ground is soft and moist and the fence is well grounded. The first time a horse touches the tape, he should feel the sting of it. Once is usually enough. In the winter, when the ground is frozen, the charge is way diminished. Add the protective layer of a blanket and two strands of electric fencing becomes a suggestion to stay behind it, rather than a command. 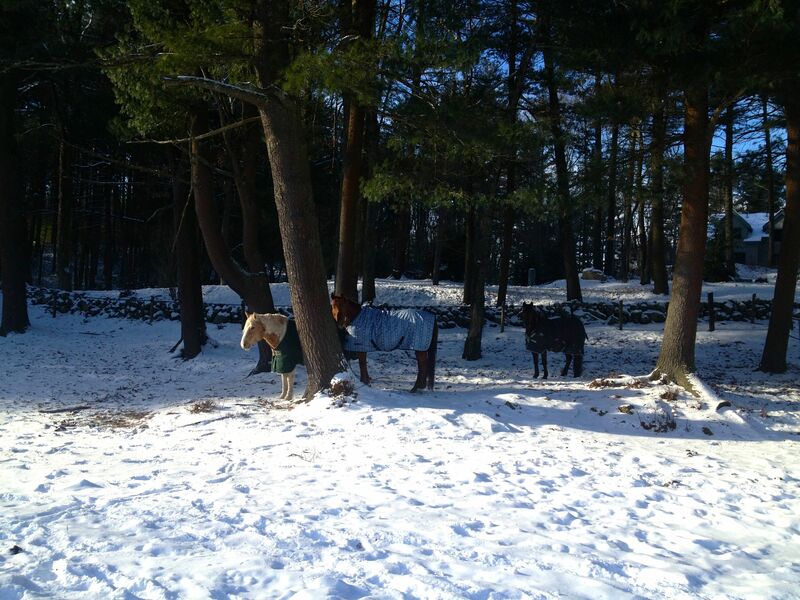 I arrived to find Freedom guarding “his” mares. Charlie was in their with them, but a safe distance away. Twice now Charlie has brought the fencing down, eager to mingle with the rest of the herd. The first time he managed to break out of his paddock and then go through the fencing that separates Freedom and Willow from them. When I arrived to feed, I rubbed my eyes, thinking I was seeing double. Instead of two horses in the paddock, there were four! Freedom, I guess, had established order during the night. He had Curly and Willow over by him. Charlie had been relegated to the very far corner of the field. Freedom takes his leadership role very seriously! For the past few years he’s been the only gelding on the property. Charlie’s new fence carries quite a significant charge and it dissuaded him from breaking out for several weeks. It was an equine Fort Knox. it’s own juice. To circumvent the problem with the frozen ground, there are two strands of tape — one serving as the ground. It was quite amped up. And it worked. At least until today. I arrived a the barn this afternoon in the middle of a nor’easter. Snow was pelting down. We had about 10″ fall on the 8″ that was still on the ground. At first I wasn’t sure that I was seeing it correctly. But there were three horses in the paddock, not too. It appears that Charlie had instigated another escape. He did not go through the same fence; he went through the back fence. Then he and Zelda conspired to bring down the fence between them and Curly. Luckily, the result was friendship, rather than chaos. I guess they are sending us a message. I’d still like to supervise their interactions for awhile. But with plenty of space and very deep snow, I guess they figured it out for themselves — or got too tired to cause trouble.